My family likes these little sour candies that Aldi sells in the checkout aisle. 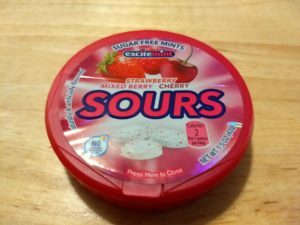 Excitemint Sours Sugar Free Mints come in a little plastic container (more on the container shortly) that fits in a purse, backpack, or perhaps a large pocket. They’re a good “mint” (although there is nothing minty about their flavor) or a treat for times when you’re on the go. They come in two flavors: strawberry / mixed berry /cherry and tangerine / green apple / watermelon. Both flavors, as advertised, are sugar free. They contain two calories per one-piece serving. They also are gluten free and lactose free and contain no synthetic colors. The package states that these have 30% fewer calories than sugared mints, with calories per piece reduced from 3 to 2. Ingredients for the strawberry / mixed berry /cherry flavor are: sorbitol, malic acid, tartaric acid, citric acid, natural and artificial flavors, magnesium stearate, colors (spirulina extract, grape extract, carmine), and sucralose. If you eat too many at once, you also may scratch the inside of your mouth because the mints have a rough texture. While they are sugar free, these candies don’t have the aftertaste I typically associate with a sugar-free product. I like how these taste, and my family likes both flavors. My only complaint is that the plastic container these candies come in has a serious design flaw. You open the container by flipping up a little tab on the top at the side. The problem is that sometimes it takes a great deal of force to open the container. Sometimes it won’t open at all. Twice, I have broken the tab completely off trying to get the container open. 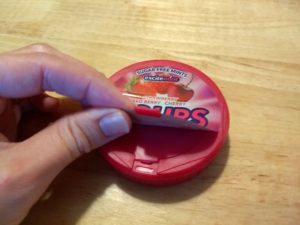 With the latest container I purchased, I could only open it by wedging a butter knife under the tab and prying it up that way. 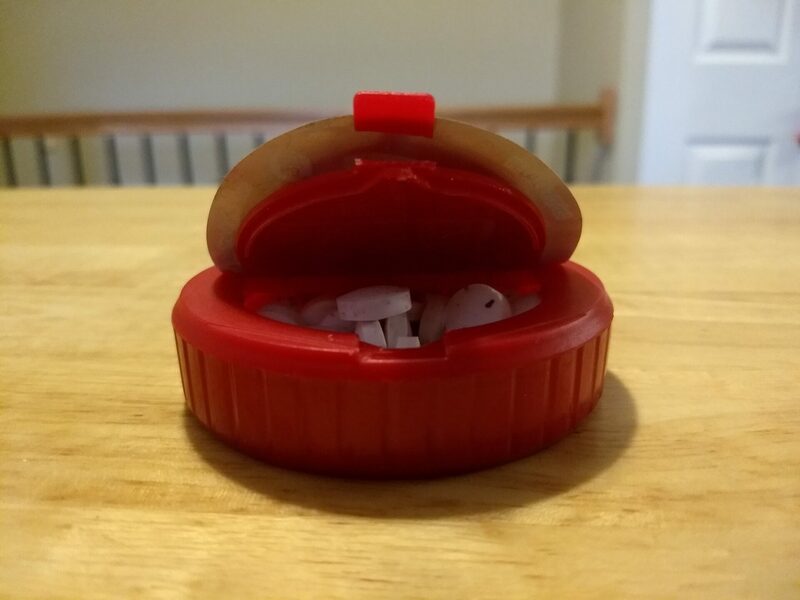 I ended up placing all the candies in an old Altoid-type container instead, and I tossed the original plastic container in my recycling bin. I’ve had more trouble and breakage with the red containers the berry-flavored candies come in. I’ve had less trouble with the green containers that hold the tangerine / green apple / watermelon flavor, but I don’t know for sure if the green containers are better quality. 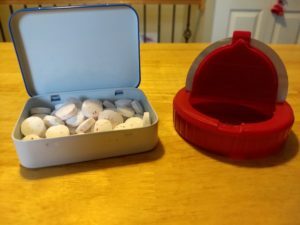 I transferred my candy to an old Altoid-type tin. I posted about this product on The Aldi Reviewer Discussion Group page on Facebook and got comments from several members who said they also frequently have trouble with these candy containers. Some do what I did and just transfer the candies to another container all together. Aldi definitely needs to redesign the container these come in. I wouldn’t mind seeing the candies sold in a more environmentally friendly metal tin. Otherwise, it’s a great product. Aldi’s Excitemint Sours Sugar Free Mints taste great and come in a couple of different flavors. The only problem is that it’s difficult to open the plastic container they come in, and sometimes the tab on the lid breaks when I try to force the container open. If you buy these, be prepared to possibly put them in a different container such as an empty Altoid tin.